Promotional Marketing Items for Advertising Events and more. 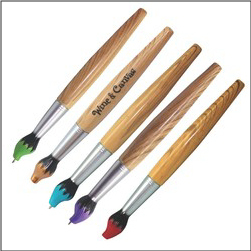 Order Customized Imprinted Paint Brush Pens – these fun pens come in different colors and are disguised as an art paintbrush. Featured in colors: red, blue, gold, purple, and green. 6inches long with a quick turnaround time available. Not recommended for children 3 years and younger. These pens are popular with paint studios and art events, trade shows and conventions, galleries and artist events, and more. Order your custom logo pens today!